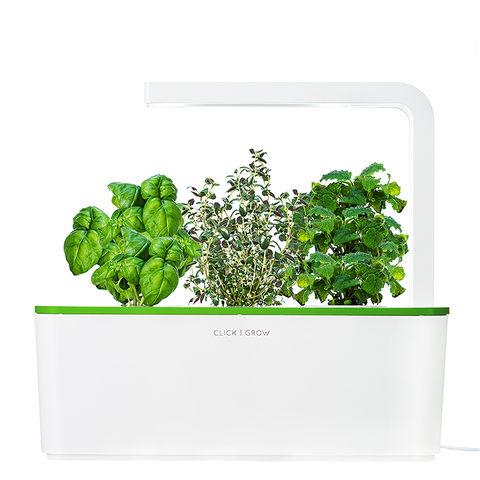 The Smart Herb Garden is the easiest and the nicest-looking indoor gardening solution out there. Just plug it in, add a little water, and let it take care everything else. Smart, simple and carefree. We use innovative NASA-inspired technology that helps the herbs grow a little faster but still 100% naturally - with no GMOs, pesticides, fungicides, insecticides, plant hormones, or any other suspicious substances. It’s all nature at its purest. Each Smart Herb Garden comes with cartridges for basil, thyme, and lemon balm, but we offer various other refills as well. When you're ready for new plants, simply replace your old cartridges with new ones.